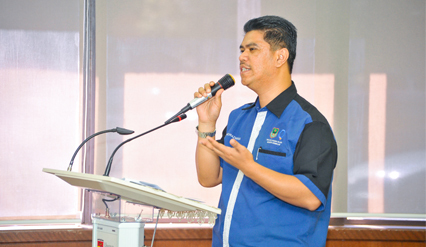 BANGI, 30 May 2014 – The two most important qualities needed by counsellors to help them carry out their jobs of counselling people are an abundance of patience and constant reading to increase their knowledge. A panel of six counsellors shared their experiences and knowledge about the world of counselling and discussed the challenges that future counsellors may face in a forum on “The Ethics, Etiquette and Law in Counselling,” organised by Post Graduate students of the Department of Psychology and Counselling, Faculty of Social Sciences (FSSK) of The National University of Malaysia (UKM). The counsellors are Haji Norazman bin Amat, Hafizi bin Harun, Azah Yasmin binti Yusof Ali, Normaliza binti Mahadi, Shahida binti Musa with Dr Nasruddin bin Subhi, a lecturer from FSSK’s Department of Psychology and Counselling as the moderator. They said there is a stigma on the counselling world in Malaysia with the public still untrusting about it and how it works with some even reluctant to try it out. Norazman, a 15 year veteran in counselling and is the Chief Executive at the Counselling Centre of the Negeri Sembilan Religious Council (MAINS), shared some of his experiences mentioning of an incident he faced during his internship in a village where he was initially rejected by an elderly man who needed counselling just because he was not married then. The man was sceptical of him and asked for a more senior counsellor. It was after office hours and late in the evening. It took him quite sometime to persuade the man to share his problems. What he learnt from the incident was the need for patience and persistence as most counsellors will be seen as too young, too old and too inexperienced in life to help them. There is a need to talk to them, let then settle and slowly win them over so they will open up. Azah Yasmin, founder and Director of BRIGHT Consulting and former host of the 3R TV Show over TV3 said as counsellors, they must know the type of clients they are handling and adapt to them, rather than the other way. She described counselling two doctors, a husband and his wife who were having problems in their marriage and how she actually read up on medical books and related areas so that she could not only understand her clients but she could also relate some of their marriage problems using medical metaphors. The panel generally agreed that though counselling has been in the country for over 40 years, it still bears a dark stigma in the eyes of Malaysians. Normaliza said Malaysians still believe that a person only goes to a counsellor if he is crazy or insane. There is the medical branch of psychiatric counselling, for those with unstable mental states or the criminally insane but there is also counselling for those with anxiety, family problems or work-related stress that has nothing to do with mental illness. This is the stigma that future counsellors need to know. Each client needed to be handled carefully but most especially those who have an already skewed presumption towards counselling as they believe it to be a bogus scheme. The forum felt that such impressions make it harder for those needing counselling to open up when they go for counselling. The public also do not believe in paying a lot of money, just to “talk about things”. As counselling sessions are verbal exchanges and conversations of emotions, stress and family matters, it is not seen as a ‘product’ or ‘commodity’ that should be bought and sold. Thus they feel they should not have to pay for it. All the panellist hoped that students as future counsellors would remember that they will have to be very cautious and patent because they will encounter people who will refuse to pay for their services. The counsellors hoped that the undergraduates and post graduates students of the psychology department will take note of their advice when they set out to become counsellors.